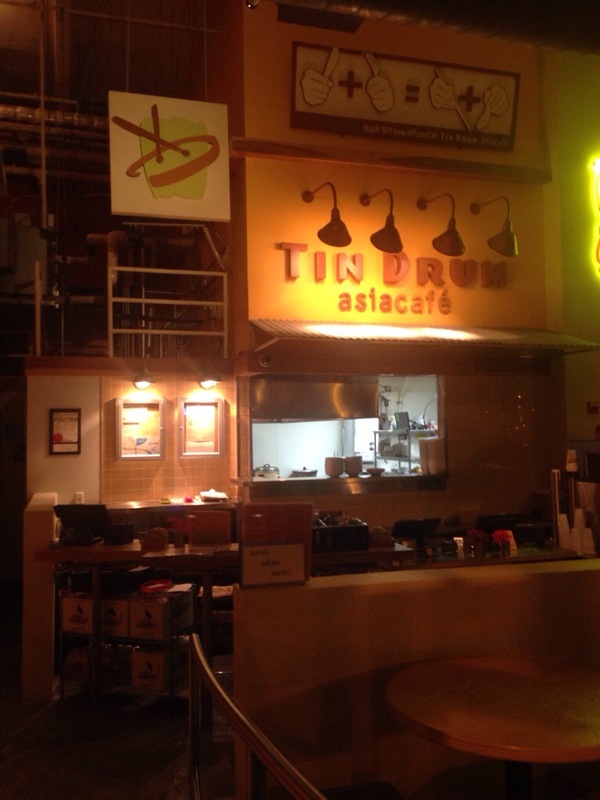 I first recall hearing about Tin Drum Asiacafe when we saw the location just off the campus at Tech Square. 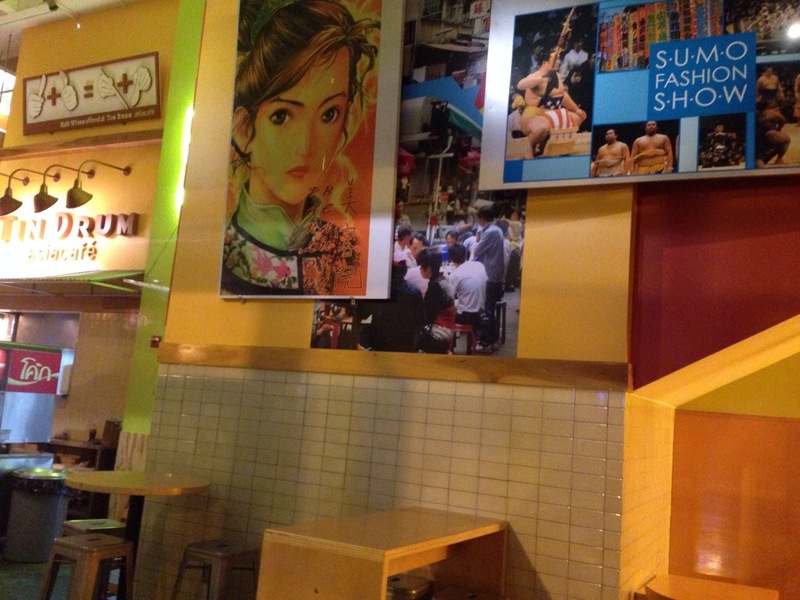 Similar to, and opened at a similar time as, Mama Fu’s and Doc Chey’s Noodle House, Tin Drum has stood the test of time. They’ve expanded into an aggressively franchising Atlanta-based brand, with 13 locations in the Southeast. We’ve eaten at the Tech Square and Atlantic Station locations on several occasions, and, tonight, on our way downtown and looking for “quick Asian”, stopped in here again. Arriving around 6:30, we walked into a nearly empty restaurant. I attribute that primarily to it being Christmas break, as this place is generally hopping on weeknights when school is in session as they accept the campus version of wampum- the Buzzcard. The menu is simple and straightforward, offering a variety of fast, fresh Asian dishes (stir-frys, curries, pads, street noodles and, oddly, tacos). One downside, it was so dark at the counter that we had to walk over next to one of the wall displays to get enough light on our menu to see what we were going to order. Part of that is a function of ocular age, but it was mighty dim therein. 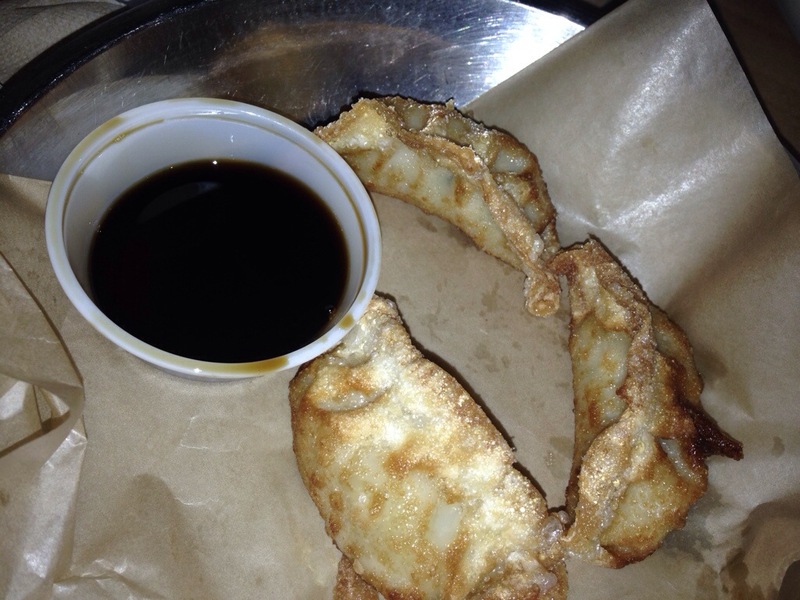 Jo decided to start with some chicken potstickers, which were quite tasty, and also ordered the sesame chicken. 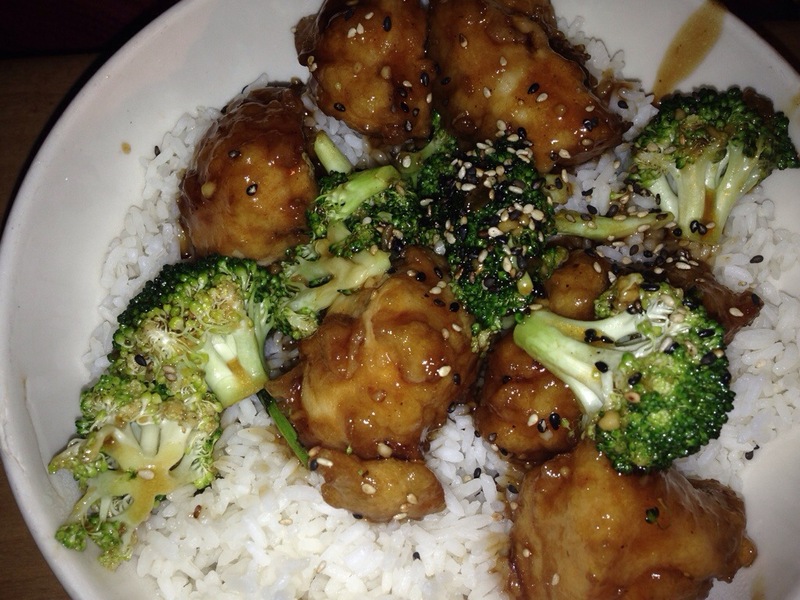 which was served on white rice (having the option to have brown rice instead would have been appreciated). The chicken was quite tasty. I was torn between the pad Thai and “something different” and ended up choosing “spicy spaghetti (Japan)”. 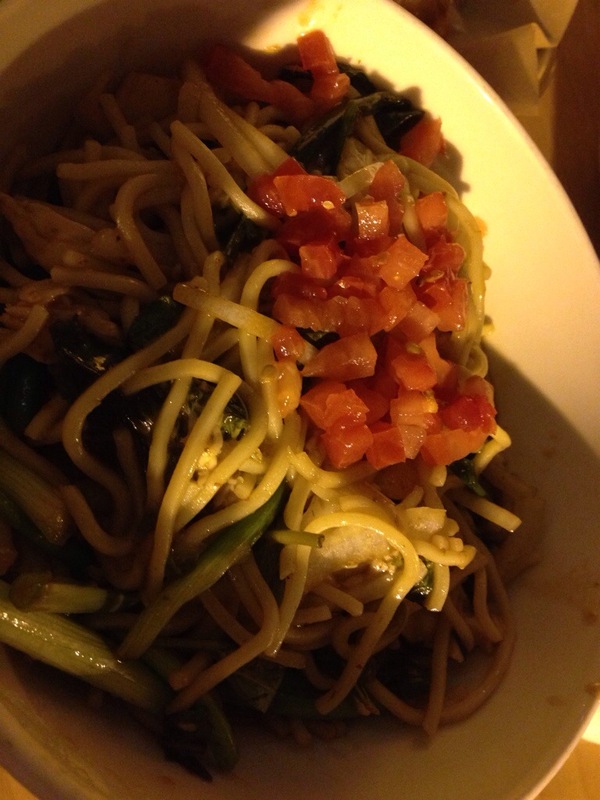 This was an interesting dish with fried yaki-soba noodles, onions, scallions, basil, tomatoes, jalapenos and sauteed chicken. It was good, although not spicy at all, and it wasn’t terribly filling. As we were heading out for the night, I decided to order something else for the road. I went back to the counter, reviewed my choices and chose a chicken teriyaki taco with no slaw. Five minutes later, it arrived from the kitchen. There appeared to be the entire cilantro plant laid across the top of the taco. 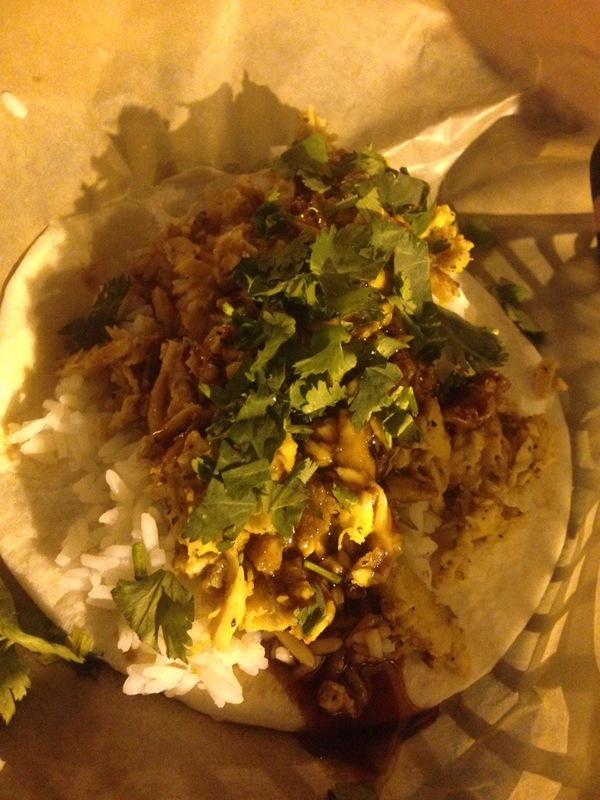 Even without the cilantro, it was way too fat to be eaten as a taco. I attempted to roll it like a burrito, to no avail, and it ultimately became a knife and fork experience. But it sure was good.